This is event is known as “The Thrash to the Onion Patch”! 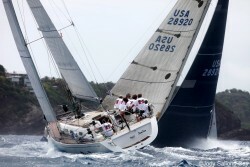 The Newport Bermuda Race is a 635-mile ocean race, much of it out of sight of land, usually lasting three to six days. It crosses a stretch of the Atlantic Ocean known for challenging weather, especially in the Gulf Stream, where there are strong currents. Every two years in mid-June, more than 150 boats start from the historic seaport of Newport, Rhode Island. The fleet has five divisions to allow seaworthy boats of many sizes and types to be raced fairly and aggressively for an array of trophies awarded in Bermuda at an elegant ceremony at Government House, the residence of the governor of this tropical island. 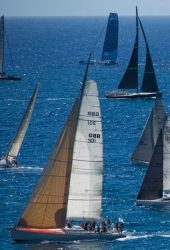 This race is a wonderful experience: you compete among the best, enjoy the camaraderie of your crew, and arrive at a welcoming, beautiful destination. Typically 20-25% of the fleet is under the command of “first-time” skippers. These skippers report a sense of accomplishment and satisfaction having prepared their boat and crew to compete, and successfully completing the race.